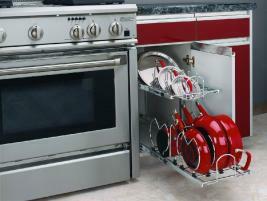 A great selection of wire pull-out organizers for all sorts of kitchen storage needs. 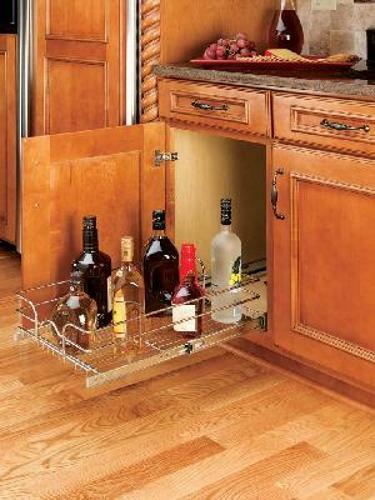 For example, these storage solutions can hold wine and spirit bottles, cookware, cleaning products, plates, bowls and cups. It can seem as though there is never enough storage space in the kitchen. 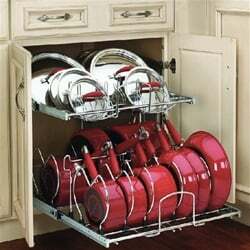 What's more, the kitchenware that standalone cabinets do contain becomes difficult to reach as the cabinets become filled. 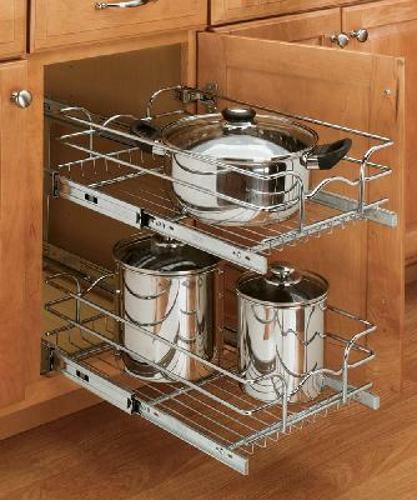 Fortunately, wire pull-out organizers provided by OVIS are perfect kitchen storage solutions. 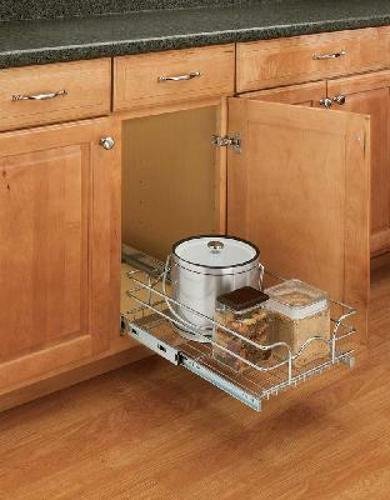 OVIS offers a great selection of wire pull-out organizers -- produced by top shelving manufacturer Rev-A-Shelf -- for all sorts of kitchen storage needs. 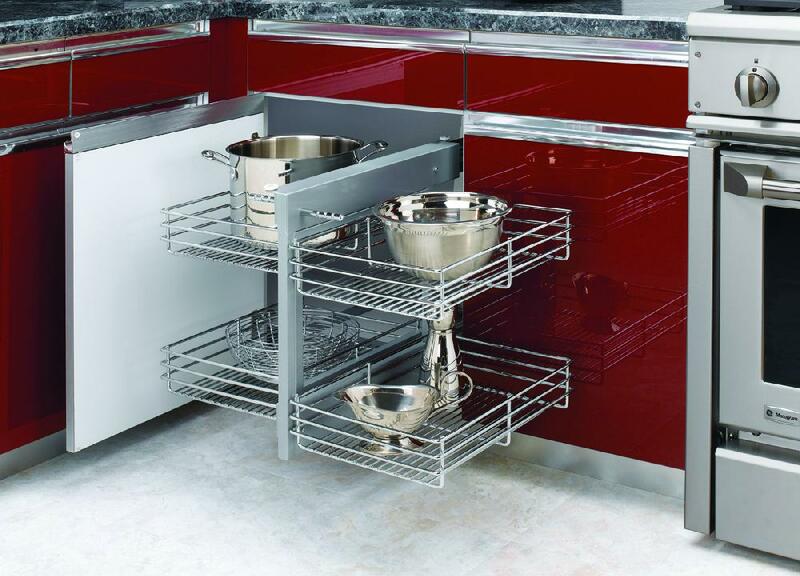 For example, these storage solutions can hold wine and spirit bottles, cookware, cleaning products, plates, bowls and cups. They maximize cabinet space by making use of otherwise unusable space within the cabinets, while holding the kitchenware in a manner that allows more items to fit. 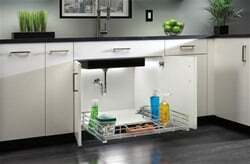 For example, the double and two-tier organizers store kitchenware on multiple levels within a single cabinet. The factor that truly makes OVIS' wire pull-out organizers truly unique storage solutions is their accessibility. Instead of digging into the back of cabinets in search of items, the wire pull-out organizers pull out (as the name suggests) so that everything being stored can be found easily. 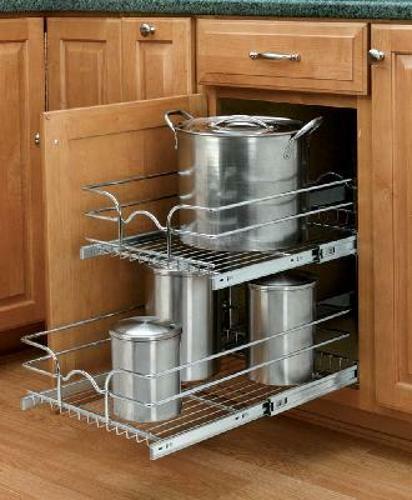 The benefits of these organizers should not be restricted to the kitchen alone. 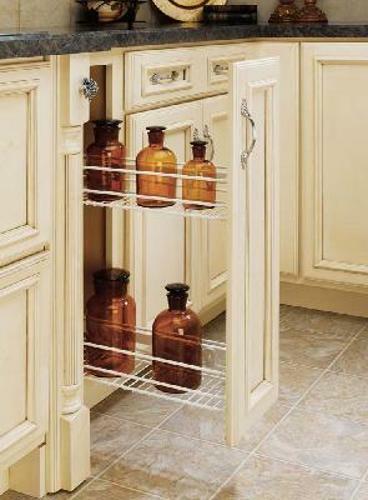 They can also be used for bathroom storage, in-cabinet wine racks, and for a whole host of other home storage needs. To learn more about OVIS' wire pull-out organizers, feel free to browse the products online. Contact us today for assistance in finding the perfect storage solution for your home. 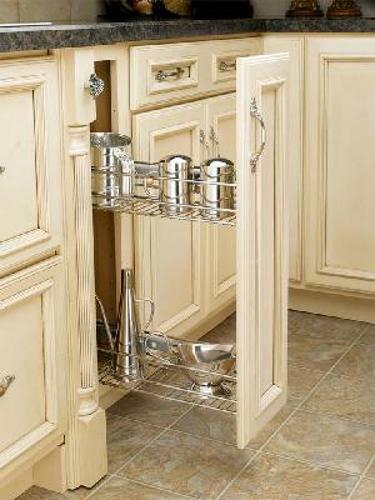 Rev-A-Shelf's New Under Sink Pull-Out Chrome Caddy is an ideal way to organize cleaning supplies under the sink and easily lift the unit out for use around the house. 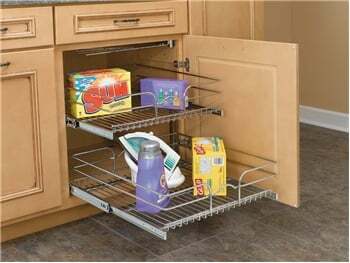 This Pull-Out Base Organizer will provide excellent storage in 9" & 12" base cabinets or can also be utilized in a wide base cabinet. This Non-Handed 5PSP Series maximizes space in blind corner cabinets while allowing the user full accessibility to the entire unit. This roll-out drawer/shelf is perfect for mounting under the sink or in a base cabinet on fixed shelves.Bottom mounting slides. Width: 8-3/8" Depth: 18" Height: 7". Minimum Opening Width: 8-1/2". This roll-out drawer/shelf is perfect for mounting under the sink or in a base cabinet on fixed shelves.Bottom mounting slides. Width: 11-3/8" Depth: 18" Height: 7". Minimum Opening Width: 11-1/2". This roll-out drawer/shelf is perfect for mounting under the sink or in a base cabinet on fixed shelves.Bottom mounting slides. Width: 11-3/4" Depth: 22" Height: 7". Minimum Opening Width: 11-1/2". This roll-out drawer/shelf is perfect for mounting under the sink or in a base cabinet on fixed shelves. Bottom mounting slides. Width: 14-3/8" Depth: 22" Height: 7". Minimum Opening Width: 14-1/2". This roll-out drawer/shelf is perfect for mounting under the sink or in a base cabinet on fixed shelves.Bottom mounting slides. Width: 17-3/8" Depth: 22" Height: 7". Minimum Opening Width: 17-1/2". This roll-out drawer/shelf is perfect for mounting under the sink or in a base cabinet on fixed shelves.Bottom mounting slides. Width: 20-3/8" Depth: 22" Height: 7". Minimum Opening Width: 20-1/2". This roll-out drawer/shelf is perfect for mounting under the sink or in a base cabinet on fixed shelves.Bottom mounting slides. Width: 8-3/4" Depth: 18" Height: 19". Minimum Opening Width: 8-1/2". This roll-out drawer/shelf is perfect for mounting under the sink or in a base cabinet on fixed shelves.Bottom mounting slides. Width: 11-3/4" Depth: 18" Height: 19". Minimum Opening Width: 11-1/2". This roll-out drawer/shelf is perfect for mounting under the sink or in a base cabinet on fixed shelves.Bottom mounting slides. Width: 11-3/4" Depth: 22" Height: 19". This roll-out drawer/shelf is perfect for mounting under the sink or in a base cabinet on fixed shelves. Bottom mounting slides. Width: 14-3/4" Depth: 22" Height: 19". Minimum Opening Width: 14-1/2". 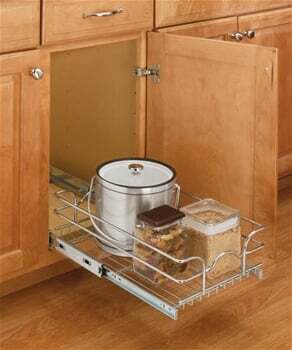 This roll-out drawer/shelf is perfect for mounting under the sink or in a base cabinet on fixed shelves. Bottom mounting slides. Width: 17-3/4" Depth: 22" Height: 19". Minimum Opening Width: 17-1/2". 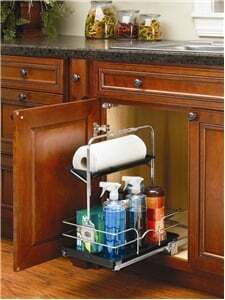 This roll-out drawer/shelf is perfect for mounting under the sink or in a base cabinet on fixed shelves. Bottom mounting slides. Width: 20-3/4" Depth: 22" Height: 19". Minimum Opening Width: 20-1/2". 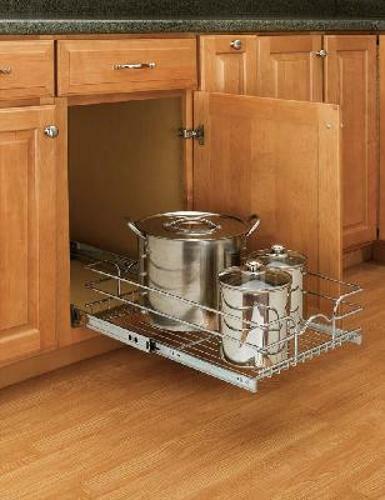 This Silver Door Mount Kit can be added to Rev-A-Shelf 5WB1 or 5WB2 Series Pull-Out Wire Baskets. Two piece bracket allows for easy installation and simple job site adjustments. Cookware Organizer features independently operating shelves for easy access and storage of various styles of pots, pans and lids . Also features bottom adjustable dividers. 11 3/4" wide. Chrome. Cookware Organizer features independently operating shelves for easy access and storage of various styles of pots, pans and lids . Also features bottom adjustable dividers. 20-3/4" wide. Chrome. This roll-out drawer/shelf is perfect for mounting under the sink or in a base cabinet on fixed shelves. Bottom mounting slides. Width: 14-3/8" Depth: 20" Height: 7". Minimum Opening Width: 14-1/2". This roll-out drawer/shelf is perfect for mounting under the sink or in a base cabinet on fixed shelves.Bottom mounting slides. Width: 11-3/8" Depth: 20" Height: 7". Minimum Opening Width: 11-1/2". This roll-out drawer/shelf is perfect for mounting under the sink. With bottom or side mounting soft close slides, this item can be purchased in multiples to double stack under the sink, providing extra storage where other products fall short due to lack of available space due to the plumbing being in the way of installation.